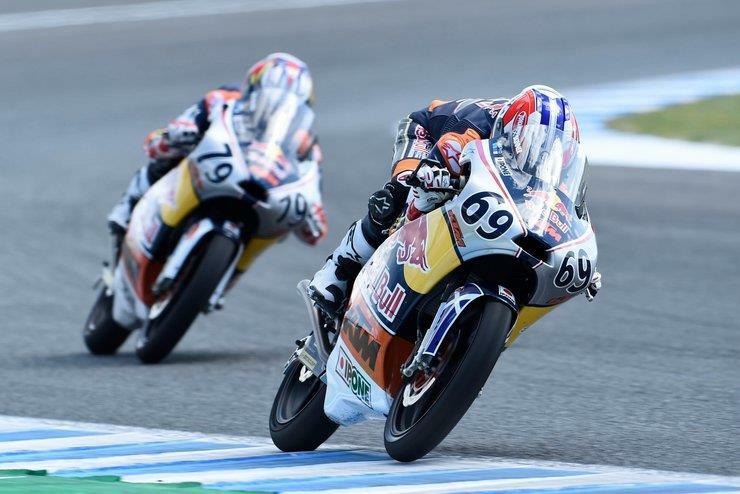 Scottish teenager Rory Skinner has taken the first international race of his career after taking a controlling victory in the opening Red Bull Rookies Cup race of the 2017 season despite a hectic race at Jerez. Skinner and Ai Ogura were set for an intense final lap in the first race of the season only to have the race stopped with a red flag. Though Ogura was leading at the time, the results were taken at the end of lap 14 when Skinner was in front. 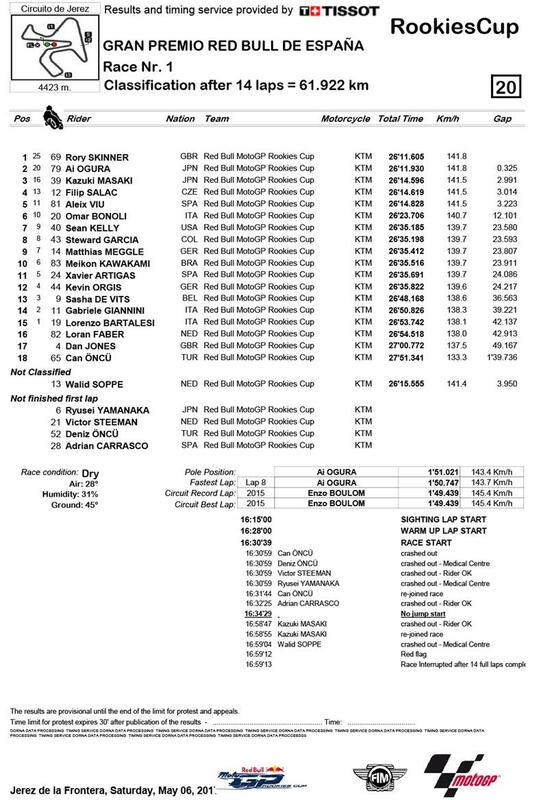 Hence the 15-year-old Scot stood on top of the podium ahead of two 16-year-old Japanese riders as Kazuki Masaki took third behind him. Skinner had only qualified ninth and wasn't helped by a first corner crash that split the field but he was quickly up to speed and reeled off a series of fastest laps as he closed down on fast starting Ogura and Masaki. He didn't waste time in getting to the front and soon pulled clear. "I had a good rhythm going and had in the back of my mind the thought that I would save the tyres a bit if I could but I didn't really build a big enough advantage and the gap varied a bit, I made a couple of mistakes and I then knew that Ai was catching. "I wasn't worried because I knew I could go with him after he came past and do something on the last lap. In Rookies Cup you can't really make a plan but if it had come down to the classic Jerez last corner that would have been OK."
Welsh teenager Dan Jones, making his debut in the class, came home in 17th, happy to have chalked up a finish in such a hectic race.